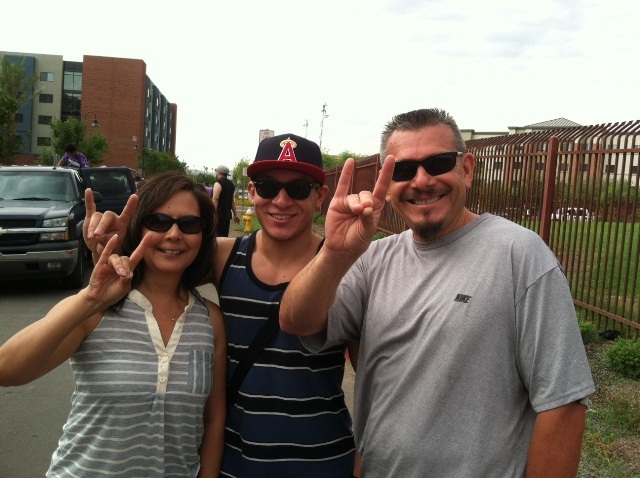 Move-In Day 1 at GCU: Are we ready? Then let’s get after it! A chorus of hoots, hollers, whistles and “welcome home” shouts, accompanied by Christian music streaming from speakers around campus, greeted vehicles packed with luggage and excited freshmen as they made their way to Chaparral and Canyon halls for Thursday’s first day of Move-In. Each arriving party received the same over-the-top hospitality from GCU’s army of volunteers clad in purple tie-dye shirts, coming in along the service road on the east side of campus. Liz, Matthew and Henry Hernandez of Colton, Calif., are all ‘Lopes Up as they arrive on campus Thursday. Bethany Rablin, a freshman from Seattle and new Chaparral Hall resident, comes from a small school of only 200 students and was amazed by the nearly 1,600 volunteers who greeted her as she entered campus. Vanessa Sandoval, a GCU senior and member of the Associated Students of GCU who served as a welcome station manager, said the stations made students feel at home as part of the GCU community. “GCU wants to build community, and (being here to welcome students) is the best way to do it,” she said. The efficiency of the Move-In crew was apparent early on, as 350 students were moved into the new Chaparral Hall between 7 and 8 a.m.
“The cross-section of people helping is incredible,” said Pastor Tim Griffin, GCU’s dean of students, clad in a purple “VOLUNTEER” T-shirt and purple Nikes while working his walkie talkie. Griffin said logistics would be put to the supreme test on Friday morning, when 700 students are scheduled to move into five residence halls (Sedona, Hegel, Prescott, Saguaro, Camelback). The stylish tie-dye shirts were receiving raves from everyone. “You can see them from outer space,” Griffin quipped. Glen Luikart of Portland, Ore., whose daughter Cheri is a freshman, was blown away by the reception. Luikart said his daughter had planned on attending the University of Oregon until she encountered a representative of GCU at a college fair at her high school. “She came home and told me we had to look at this,” he said, noting that Chaparral was only a dirt patch when they first visited campus. ● Thomas Popik and his daughter, Alicia, arrived at GCU at 5:55 a.m., just as the sun was illuminating an appropriately violet-colored sky. The pair was greeted by dozens of cheering volunteers, a sea of purple that could be seen all the way down the road from where they entered campus on 35th Avenue. Thomas Popik of Phoenix helps his daughter, Alicia, load into her room. Not a half-hour later, the Popiks’ vehicle was unloaded, and Thomas was surveying Room 529, his only child’s new abode for the next year, and testing the comfort of a new couch in the living room. Alicia, 17, a graduate of nearby Bourgade High, plans to study nursing. She became interested in the field and in GCU when, as a junior, she visited campus on a biology field trip and got to see the cadaver lab. ● The Dapello family of Los Angeles had only been waiting in a line of cars for about five minutes when, at 6:40 a.m., a team of smiling volunteers swarmed their vehicle and quickly unloaded its contents. The Dapellos had driven through the night to get their daughter, Brittney, to school on time. Mom Cynthia was overwhelmed, both by the outpouring of love she felt and by leaving her 17-year-old behind. Stephanie, Sydney and Jeannette Poolneco celebrate Sydney’s arrival on campus. ● As the Poolneco family of Winslow arrived at the unloading checkpoint, a volunteer called out “two-fer!” (That’s GCU volunteer code for two cars needing to stay together.) Jeannette Poolneco, of Maricopa, piloted a Suburban piled with the belongings of her granddaughter, Sydney, who rode in a separate vehicle with her mother, Stephanie. Sydney, who plans to become a pharmacist, is enrolled in the pre-med program. She made up her mind to come to GCU two years ago after attending Discover GCU. “I just love how open everything is, how nice people are, and I’m so happy I made the choice to come here,” the 18-year-old said. ● While most families arrived in sedans, SUVs and trucks of all shapes and sizes, several spiced up their rides a bit. A van from the Hyatt Place in Phoenix gave curbside service to Lisa Erbes and her daughter, Ali, 18, and little sister, Bailey, 6. The family from Rockford, Mich., has been staying at the hotel. Jodi Lander arrived in her car, which had pulled a small U-Haul trailer all the way from Prineville, Ore., a 21-hour trip. The contents of the trailer belonged to two freshmen, Lander’s daughter, Kyria, who moved in Thursday, and family friend Josiah McRae, who was scheduled to move in Friday. ● One of the last cars in line Thursday morning belonged to the Hernandez family, of Colton, Calif. The driver, Liz, mother of Matthew, 19, honked in response to the cheers from volunteers, and dad Henry returned their waves. Matthew, whose major is nursing, beamed from the back seat. Senior Zack Filbrun has a Hefty job as a Move-In volunteer. ● A tear to his left ACL and meniscus couldn’t keep Tanner Enderle away from Move-In. The 20-year-old Christian Studies major hauled up the stairs in Chaparral Hall heavy suitcases, boxes of TVs, microwaves and vacuum cleaners, and black garbage bags brimming with plates, peanut butter and personal effects. Enderle is a Life Leader in Prescott Hall. What’s with those fanny packs? Volunteer Steve Egeberg sports one of the neon fanny packs. 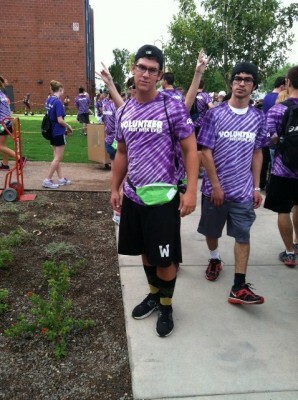 Hey, GCU, the 1980s called and said those neon green fanny packs are awesome. Move-In volunteers and incoming freshman could be seen across campus sporting the fanny packs as part of the Move-In “Best Week Ever” retro theme. Fanny packs, or “swag bags” as dubbed by the Office of Student Affairs, came stuffed with a number of Welcome Week essentials, from Chap Stick and sunglasses to event calendars and campus discount information. “In the past, we have always given students backpacks filled with gear, but this year we chose to go with fanny packs because they go with the Welcome Week theme and the neon yellow shirts,” said Anthony Mann, GCU’s student engagement manager. With so many people on campus Thursday and Friday, campus public safety staff are busier than usual. GCU officers typically assigned to graveyard shifts stayed overnight to be available to assist the overall Move-In effort and off-duty Phoenix police officers helped manage traffic flow on Camelback Road to avoid unnecessary logjams. Other Phoenix officers with area neighborhood-enforcement teams were on and around campus to assist in case of an emergency. Public Safety Director Henry Griffin said 58 GCU officers were available on the ground campus during the first day of Move-In. As part of an ongoing Department of Homeland Security initiative, GCU students and staff are encouraged: “If you see something, say something!” The slogan is emblazoned on fliers and handouts for new students, and public safety officers plan to interact with students more throughout Welcome Week. More information on GCU’s emergency alert systems, text-message crime reporting and other safety tips is available at www.gcu.edu/PublicSafetyOffice. Hauling luggage from cars and up flights of stairs to dorm rooms can be grueling, especially in the 100-degree Phoenix heat. But no one is going thirsty if AJ Albanese has anything to say about it. 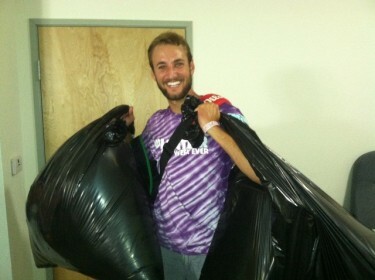 Albanese, GCU’s director of catering, helped set up more than 20 water supply locations for the two-day Move-In. More than 6,000 pounds of ice and 11,000 bottles of water and Powerade arrived on campus earlier this week. Tents are stationed at all major entrances and residence halls across campus and come stocked with ice-cold water and Powerade available to volunteers, students and parents. Large ice trucks and coolers with extra ice and beverages are next to campus hot spots such as the 35th Avenue entrance and Prescott Hall to refill empty coolers. Sodexo Food Service Solutions employees are covering campus on foot, handing out drinks to parched volunteers and visitors. “We’re trying to get students moved in as quickly and efficiently as possible, but also keep their spirits up and make sure the heat isn’t getting the best of them,” Albanese said.